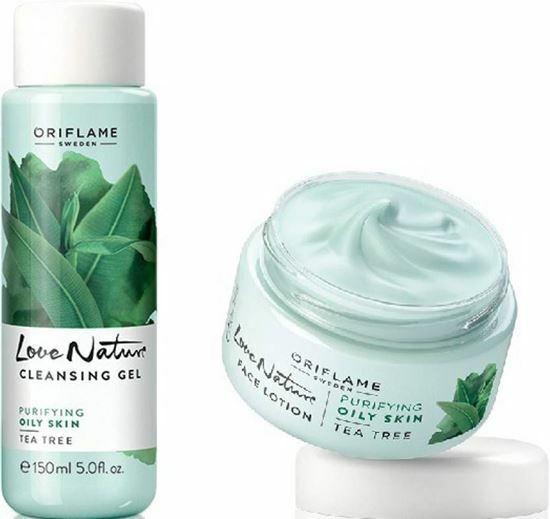 Oriflame Combo contains one cleansing gel and one face lotion. Cleanser-Love Nature Cleansing Gel Tea Tree-Effectively cleanses oily skin with the power of Tea Tree essential oil. Removes ; impurities, make-up and excess sebum, helping to prevent blemishes without over-drying.150 ml.Face lotion-Love Nature Face Lotion Tea Tree.50ml.Easy to absorb, rebalancing face lotion with Tea Tree essential oil provides the right lightweight hydration for oily skin.